- Designed specifically for the Mobile World without cables. - internal Bluetooth and Wi-Fi /802.11b wireless LAN. - up to 2.8 GHz FSB400 Intel Pentium 4 processor. - up to 2 GB DDR333/DDR400 SODIMM via two sockets. - up to 100 GB hard drive (easy-to-change). - internal 3.5" 1.44 MB floppy drive. 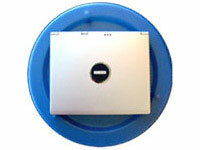 - Choice of optical drive: CD-ROM, DVD-ROM, CD-RW, COMBO (DVD-ROM/CD-RW) or DVD-Burner (DVD-R/-RW or DVD+-R/+-RW). - Ports: 1x type II CardBus PCMCIA; 3x USB 2.0/1.1; 1x IEEE1394/FireWire; 1x S-video TV out; 1x Serial; 1x LPT1/ Parallel; 1x IrDA; 1x CRT; 1x PS/2; 1x headphone; 1x mic-in; 1x RJ11 for modem; 1x RJ45 for LAN. - Standard: Carrying bag, auto-switching AC Adapter, Smart Li-Ion battery.